The album was recorded in 1970 in London, during Howlin's European Tour. The album was recorded in a week and also featured on other songs: the great Klaus Voorman, John Simon, Phil Upchurch, Joe Miller, Jordan Sandke and Dennis Lansing. Additionally there is a musician credited as "Richie" on drums on the song "I Ain't Superstitious". The real identity of this drummer is none other then Ringo Starr. The "False Start and Dialogue" is a real treat, as Clapton and Winwood try and convince Howlin' to play with them on "THE RED ROOSTER", while he is giving instructions on how to begin the song..including the great line..."See, he drops in when you say...BOOOOM!" 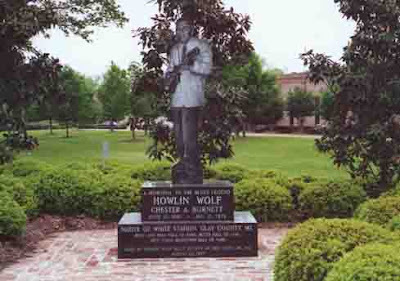 In the end, Howlin' won the discussion as he is not playing on the complete recording of the song heard following the discussion. One of the final highlights of a wonderful career, Mr Burnett left us on January 10, 1975 in Hines, Illinois at the age of 66. I hope you enjoyed this piece of true brilliance. THE COUCH has to say it liked the fact that the answer was not submitted within five minutes of the song posting as has been the case in the past, but we will try and find a better choice for next week. Hope your holiday was special and filled with love and smiles and friends and family. Special WORDLESS WEDNESDAY NAME THAT TUNE this week in a couple of ways. And secondly, because it is a special recording it is a bit more precise. This is a specific recording. You need to name the song. Name all of the people who played on this particular recording. Hey Vince...since I can not listen to your "specific" tune...I wanted to tell you that my Grandson, Michael, has an autographed guitar....by whom...you must be wondering....well by "The Grateful Dead"! of course...it is awesome! Are you just green with envy? LOL! Why can't I hear your "tune"? Yes, I have my speakers on...hmmmm Happy New Year, my friend. Incredible tune, enjoying it so much Bond baby, thanks. But have no idea what it's called - so uncultured! Ah Vinny---Such good music to start the day. Welcome Back!! SUEANN: Very cool item... Not sure why you can't hear the tune...are you getting an error message? Happy New Year to you ya old married lady! TISHA: i absolutely love this version fo this song..
You have me stumped on this version. I know the song and that it has been covered by God and every one of his cousins. For a treat, come visit my blog; I've posted a video treat just for you that relates to this one. You've got me on the version dear.. but Desert songbird is right.. the whole flamdamily has done a version of this! Howlin Wolf remains a favorite of mine!... LOL the irony.. you would pick that song.. hehehe! whoops typo " The Rocking Chair Album"
AHHH still messed up. Wish you could edit these things. I'm glad other people knew, because I'm at a loss. Name That Tune is one of the things I am worst at! Hope you had a safe holiday. Wolfs eat ducks.. just saying..
Why do I get the impression that you derive great joy from vexing others? Is that just my thinking, or do other COUCH loungers feel the same? throw me a bone here! maybe a "what i got wrong hint"?????? is false start an actual part of the name? I think if Damm and I put our answers together we have a joint win. I just realized what he is missing. Desert Rat got an honorable mention -- wooohooo! She's one of my bestest, dearest buddies -- good on ya! Thanks, Bond! I wandered over here from The Ice Box - was advised the couch was worth a sit and was pleased to find that it delivered. I'll be back. DAMM: Throw a bone to a duck? huh? ANOTHER: Nice try but umm nope. DIANA: Team play is allowed as long as the judges do not know..but there can only be one winner. SUEANN: um no one won... Do they get their name in lights for witty banter? I think the team of Double D's is appropiate! It was myself and Damm. Hmmpf, I'm going to take that personally. No wins for partial answers... check the rule book... Why does the Canadian judge keep having to say this? Oy, I need to go away from Jerzee.